The chances of tooth loss increase for everyone as they get older. Tooth loss can create various complications, from discomfort, to trouble eating, to the hassle of having to get dentures. Extensive tooth loss can also lead to a lack of self-confidence and a reduced self-image. No one deserves to go through life with these feelings and problems with their teeth, and the great news is they don’t have to anymore. The implant technology of the All-on-4® procedure can help solve all these problems at once, so patients can enjoy the immediate and long-term benefits of their new teeth. All-on-4® works by supporting the entire arch of the mouth with only four implants. The procedure can take place on either the upper or lower jawline. In only one visit, patients in the Pasadena, La Cañada, and Glendale area will receive multiple implants that provide the original look and functionality of natural teeth. This procedure differs from traditional dental implants, which sometimes require twice as many individual implants and also requires bone grafting in most cases. The All-on-4® procedure provides better benefits for patients when compared to traditional dental implants without any of the drawbacks. The All-on-4® procedure is perfect for people who have significant tooth decay and need multiple teeth removed. It’s also great for patients who have experienced bone loss to the extent that regular implants are no longer an option. Our doctors can work with patients in the Pasadena, La Cañada and Glendale area who are currently experiencing these conditions and need a quick solution to their oral health issue. We will conduct a complete evaluation of every patient’s oral health in order to provide the best recommendations and treatment options possible, which often involves the All-on-4® procedure. 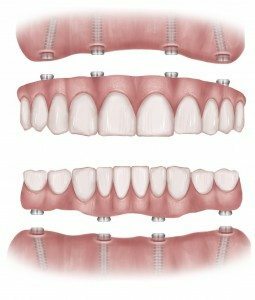 Getting a full set of implants that function and look like their natural teeth in only one day. Not requiring bone grafts, which makes getting implants a possibility for patients who have major bone deterioration. A more affordable treatment option compared to other procedures since bone grafting isn’t necessary. A shorter and much easier recovery compared to other procedures. Completing the entire treatment in one visit, since the procedure requires fewer actual implants. When considering the facts that patients won’t have to go through an invasive procedure or recovery period, could save money and have completely natural-looking teeth, it’s easy to see why so many patients in the Pasadena, La Cañada, and Glendale area choose the All-on-4® procedure. What Actually Happens During the All-on-4® Procedure? Our patients in the Pasadena, La Cañada, and Glendale area will first need to come in for an initial consultation. Our doctors will examine a patient’s teeth, dental arch, and jawline. A plan of action will then be created for the procedure. The surgery will last about an hour-and-a-half and can involve either intravenous sedation or local anesthesia. If needed, our doctors can perform the surgery in an outpatient center. Our ultimate goal is to ensure every patient is as comfortable as possible throughout the process. The first step of the All-on-4® surgery involves replacing existing teeth with implants. These implants act as a foundation on which our doctors will attach the new teeth. A few hours after the implants have been completed, the new teeth will be attached. These teeth will form a solid foundation with the implants. These new teeth are referred to as transitional teeth. After four or five months, the implants that form the foundation will have grown stronger. At that time, the transitional teeth will be replaced with permanent hybrids. These look and function just like natural teeth and will last for many years. From the moment patients leave our office, their new teeth will function just like the natural teeth always did when they were healthy. Some follow-up visits to our office may be needed simply to ensure the new teeth are stabilized and functioning normally, which is almost always the case. Our dentists will provide patients with complete aftercare instructions once the All-on-4® procedure is completed, but most patients simply need to care for their new teeth with a good oral health routine. The All-on-4® procedure allows our patients in the Pasadena, La Cañada, and Glendale area to feel confident about smiling again and returns a level of functionality that was lost with missing teeth. We truly believe everyone deserves to feel confident and happy with their smile, which is sometimes hard to do without a mouth full of perfect teeth. Having the ability to smile without being self-conscious about the teeth has proven to have many benefits, including a boost of self-esteem, enhancing the mood and having an overall positive attitude. Lytle, Tate & Stamper is a proud, long-standing member of the oral surgery community in Southern California. Our facilities feature state-of-the-art technology and have been home to some of the most prestigious surgeons in the region since 1927. We pride ourselves in offering our Pasadena, La Cañada, and Glendale patients the most advanced equipment and procedures as well as an inviting, professional, and kind atmosphere for them to feel comfortable and safe. Our doctors strive to turn every patient’s dream of having beautiful teeth into a reality, and with our All-on-4® procedure, this transformation is within reach for virtually every patient. All it takes is a brief evaluation to determine the appropriate steps to take for each patient to have the teeth they’ve always wanted. We look forward to the opportunity to work with the Pasadena, La Cañada, and Glendale community and to fulfill your dental needs, so contact us today to schedule a free consultation with our doctors and see if the All-on-4® procedure is right for you. Let Us Know How We Can Assist You. Any Questions Are Welcome! "Dr John Lytle is a true professional. I was very nervous but he made the experience very easy. He even have me his cell phone number! I highly recommend these guys. It’s obvious they know exactly what they are doing." "Dr. Stamper is amazing! I would definitely recommend him to my friends and family." "These guys have worked on everyone in my family at one time or another over the past 20 years. They are real pros. Always reliable. Never a problem. Highly recommended." "I had six teeth implants with Dr. Lytle. I dislike anaesthesia. On March 11, 2013, I had three teeth implant without having to go through any anaesthesia. I never had any issues that some of people I know had when they had tooth implant, such as infections. He is the best and I recommended him to my friends and I will recommend him to anyone. Dr. Lytle is excellent Dr. with very professional and friendly staff."